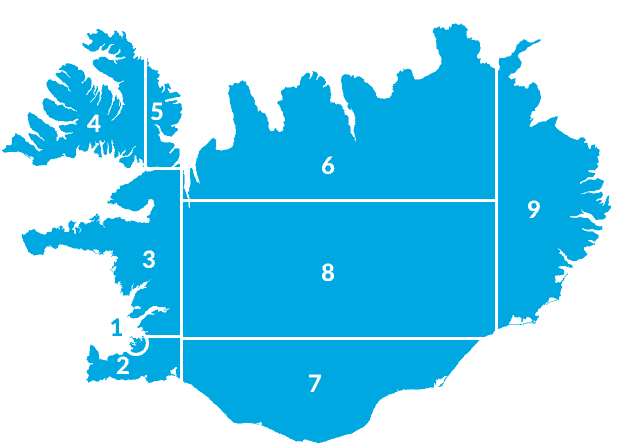 Prior to 1950 the 1˝ km long course of the glacial river Jokulsa was uninterrupted by any lagoon. Since then the glacier tongue has retreated and a lagoon, gradually increasing in area, was created. The average flow of the river is 250-300 mł/sec. and the edge of the glacier snout floats on the water. It calves into the lagoon and icebergs of different sizes can be seen aground and melting rather quickly. The lagoon is 284 metres deep. The river gets shorter and shorter, mainly because of the constant sea erosion, which eventually is going to destroy the bridge (built in 1967). The result will be a deep bay, which is going to grow longer the further the glacier snout retreats. The lagoon’s surface has been lowered almost to sea level and sea water enters with the tides, increasing the water temperature. Salmon, capelin and herring enter the lagoon and the harbour seals follow the food. Eider ducks are very common on the lagoon. It is an unforgettable adventure to take a boat trip between the icebergs to admire the natural ice sculptures and the blue green colour of the ice. Just east of the lagoon is a small restaurant with toilets. The distance from the capital along the south coast is about 400 km. 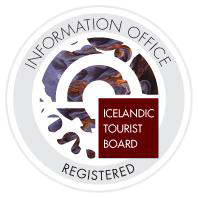 Jokulsarlon is on the Saga trail for South Iceland. Before 1950, the course of the Glacial River (Jokulsa) was about 1½ km (2 miles) long and the lagoon did not exist. Since then the glacier tongue has retreated and the lagoon is constantly growing in size. The average flow of the river is 250-300 m³/sec., and large chunks of ice brake of the edge of the ice, which already floats on the water. The deepest parts of the lagoon are at least 160 m below sea level and the river is getting shorter by the minute, mainly because of the sea erosion. In 1998, it was about 500 metres long. In 2003, the road authorities launched a project to prevent further erosion by raising the level of the lagoon and constructing robust boulder dykes. The surface level of the lagoon is dropping and the effect of the tides grows. Herring, capelin, salmon, and probably other species of fishes enter it and the harbour seals follow the food. Eider ducks swim between the icebergs and on the outwash plain around the lagoon is the realm of great skuas, arctic skuas, arctic terns, ringed plovers, and other avifauna. One of the unforgettable adventures of the stay in Iceland is a boat trip on the lagoon to marvel the natural ice sculptures and the colour display of the old ice. The boat outfit on the lagoon runs a restaurant there as well every day during summer. The distance from the capital is about 400 km. In 1992, River Stemma stopped running and the Stemma lagoon was discharged along the edge of the glacier into The Glacial Lagoon as can be seen by the bridge crossing the dry riverbed further east. Because of the retreat of the western part of the glacier snout, still another lagoon, Breidarlon, started appearing in the early twenties. It was discharges by River Breida over a distance of 6-7 km to the sea, but in 1954 it eroded a now course into River Fjallsa further west. The steep glacier tongue Fjallsarjokull, and the big, flat Breidamerkurjokull were merged until 1946 in front of the nunatak Mt. Breidamerkurfjall. Since then, both have retreated and parted, leaving only dark and desolate sanded areas behind. From the beginning of the settlement of the country until the climate started growing colder, this area, a 7 km wide valley, was inhabited. The farms then disappeared under the ice, but up to this date, the discharges of the glacier have delivered some proof of a former fertile valley in the form of chunks of soil and trunks of trees. Ever since the lagoons started developing in the twenties, the coastline on both sides of River Jokulsa has retreated because the silt was not carried all the way to the sea, but deposited on the bottoms of the lagoons. This has disturbed the balance and more sand and silt is transported away from this area by the sea erosion and currents than is deposited. During the period 1904-1989, an eight km long stretch of the coastline has retreated 8-10 m annually and during the last decade of the 20th century, the erosion grew constantly. Measures to protect the 1967 bridge across the glacial river Jokulsa were started in the early 21st century. The road around the country, rd #1, owes its existence to it.